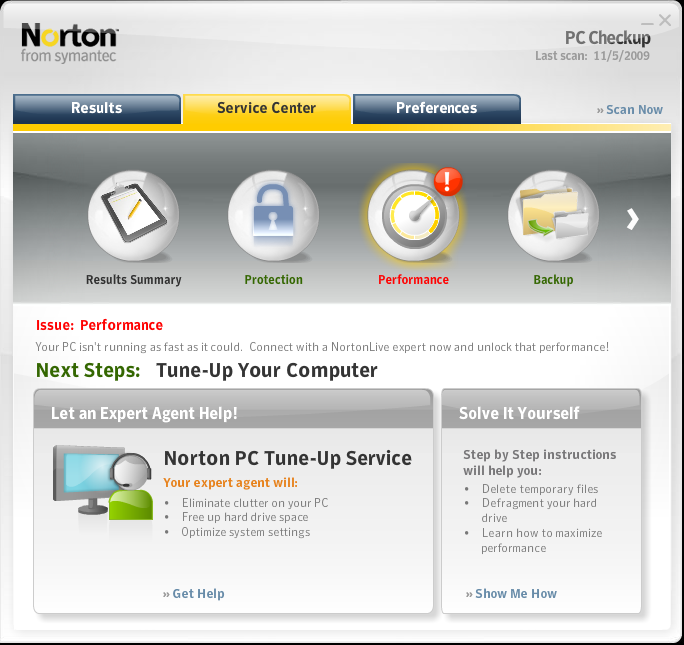 Norton PC Checkup is a free diagnostic tool that scans your PC to identify security, performance and system-related problems. Over 200 elements of your PC are scanned each time, giving you a complete and customized report on your PC?s overall health. Through its simple graphical user interface, you can review and perform simple do-it-yourself steps to fix PC problems, upgrade or purchase needed software, or call an expert for remote help ? all right from Norton PC Checkup. You can easily improve your PC?s performance and security, saving you both time and money.
? First, PC Checkup performs a deep diagnostic scan of your computer every week to ensure you have the latest information about your PC. This full system scan takes less than 10 minutes on most computers.
? Second, PC Checkup works quietly in the background to proactively detect and alert you to PC problems before they get bad enough to interrupt your digital life.
? Free! Because we feel it is important to educate everyone about security and protection.